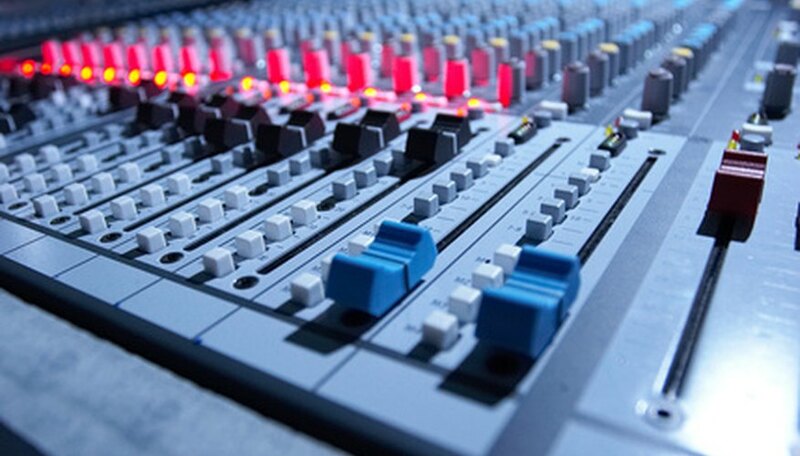 Behringer manufactures a line of audio mixers for managing the sound of live performances and for shaping the tonal qualities of music in the studio. The company's mixers can be connected to a computer or laptop with some very basic equipment to convert the jacks on the mixer into a size that can be hooked up to the computer. Once connected, the computer can be used as an audio source for inputting sound to the mixer, or as a recorder for capturing the mixed sound. Insert the two plugs on one end of the audio cables into the jacks on the Y adapter. Connect the plugs on the other end to a set of audio input jacks on the Behringer mixer. Each of the company's mixers is equipped with at least five audio input jacks. Insert the mini-plug on the Y adapter into the computer's "Line IN" audio jack, typically located on the back of the tower, or the edge of a laptop. Connect the plugs on the other end to the "Master OUT" jacks on the Behringer mixer. Shut down the computer and unplug the mixer while connecting the two components.